Wear TCU Purple Today (10/11) @ Hulen Mall from 12-1:30pm for FREE Giveaways! 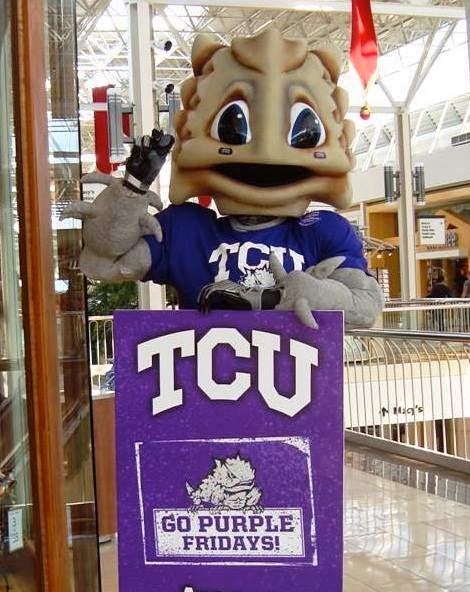 The TCU SuperFrog will visit Hulen Mall in Fort Worth , Friday (10/11) from 12:00pm to 1:30pm and will be rewarding shoppers wearing TCU purple with TCU Branded Merchandise and FREE Giveaways! Previous postFREE Opportunity to earn Boy Scouts Aviation Merit Badge @ Meacham Airport Sat. (10/12)! Next postGroupon ~ $10 for Four Rides at Rockwood GoKart Track!